Ok, so these aren’t cupcakes but they were meant to go on top of some cupcakes. However, there seems to be a baking powder shortage. The Co-op at the of the road has stopped stocking baking powder (how ridiculous is that?!) so I thought that I would be able to get some from Sainsburys but similarly it has stopped stocking it and only had individual 30g sachets…. which, yep you guessed, were sold out! Forth supermarket later and I still hadn’t managed to find any – I think somebody is trying to stop me making so many cupcakes!! So I decided to give up on the cupcake idea and just go with the cookies but next time I find some in the supermarket (if anywhere still stocks it) I will be buying at least 10 pots of it so that this cannot happen again. 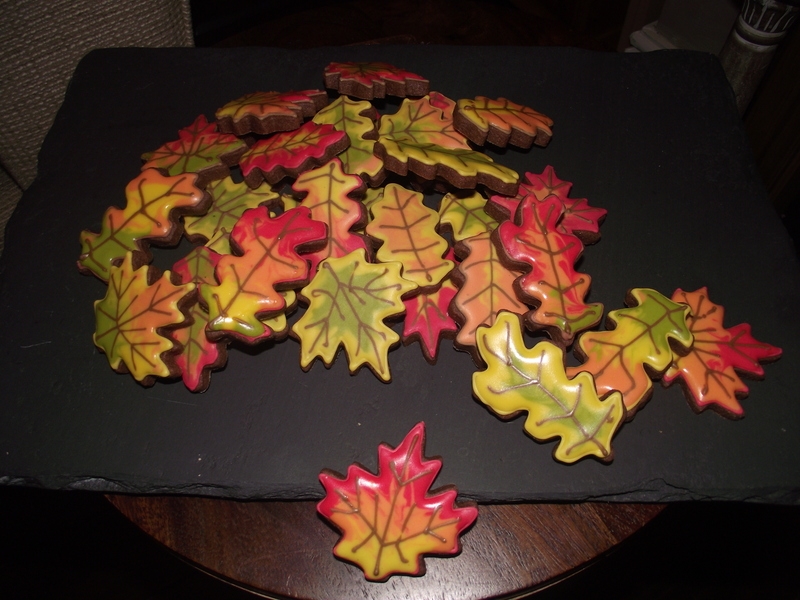 I ordered some leaf cookie cutters last week and they arrived on Friday. I was really tempted to use them immediately but I told myself that I couldn’t do any baking this weekend until I’d cleaned the house so I had to wait until Saturday evening! It was a good plan – I now have a sparkling clean house, clean clothes to wear for work next week AND about 60 pretty chocolate biscuits! 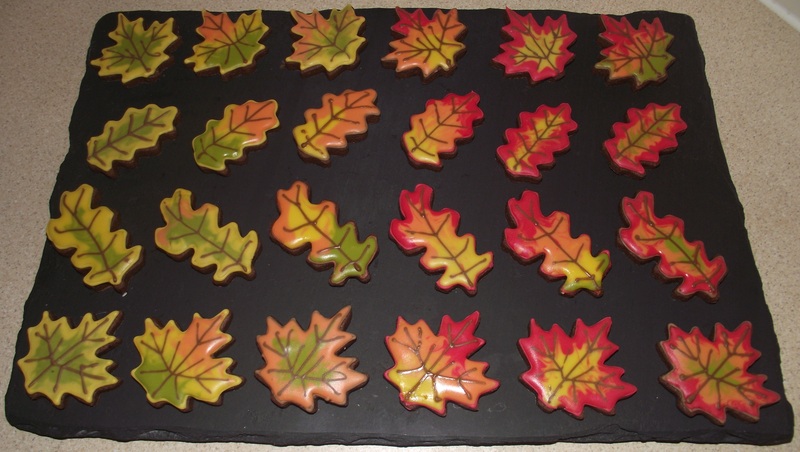 To ice them I used royal icing – 2 egg whites and about 500g icing sugar – which I divided into 5 bowls and coloured yellow, orange, red, green and brown. I don’t weigh the icing sugar out, I just keep adding it a spoonful at a time until it’s the right consistency (a fairly thick paste). When icing biscuits, I find the best way is to use the “flooding” method – pipe icing as an outline around the edge of the biscuit, then thin down the icing slightly (with a splash of water) and then either pipe or spoon it into the middle and use a cocktail stick to spread it out to the edges (and for these ones to swirl the colours together) so it fills the whole area. Cream the butter and sugar together, until smooth and creamy. Beat the egg in slowly until well incorporated. Sift in the flour and cocoa powder and stir in until just combined. Form it into a ball and chill in the fridge for 30mins. Once the dough is chilled, knead it briefly on a lightly floured surface and then roll out to about 3mm thick. 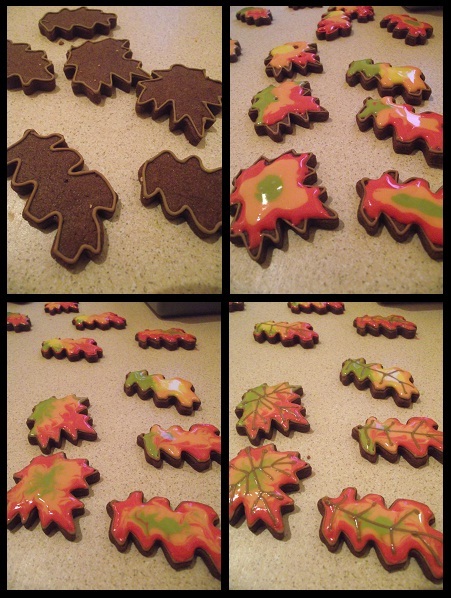 Using cookie cutters cut out the shapes you want and place them, slightly apart on a baking tray lined with baking parchment. Place the tray back in the fridge to chill the biscuits again for another 30mins. Pre-heat the over to gas mark 3 ( 175 C). Take the biscuits out the fridge and place them in the oven. Bake for 6-10 minutes depending on the size – check them after 5 minutes and turn the tray around. The biscuits should spring back when touched. Leave them to cool on the tray for 5 minutes and then place on a cooling rack to cool completely before you ice them. thank you! they’re nearly all gone so maybe they weren’t pretty enough… perhaps I should try harder next time!